XR-5 cover contains gases for odor control, in addition to allowing an oxygen-free environment for wastewater treatment. Location: Port Angeles, WA U.S.A. This floating cover, using approximately 110,000 square feet of 8130 XR-5, is in service at ITT Rayonier's Port Angeles, Washington paper mill. The XR-5 cover contains gases for odor control, in addition to allowing an oxygen-free environment for wastewater treatment. 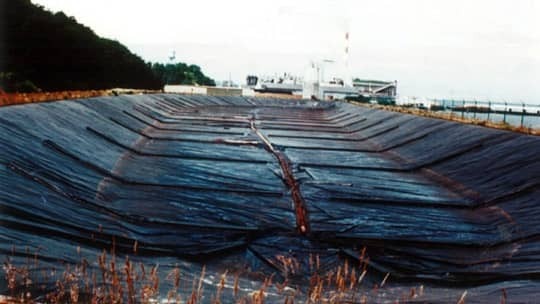 The flexible, yet strong, XR-5 can move with levels in the impoundment, as shown in this photograph where the cover is resting near the bottom.